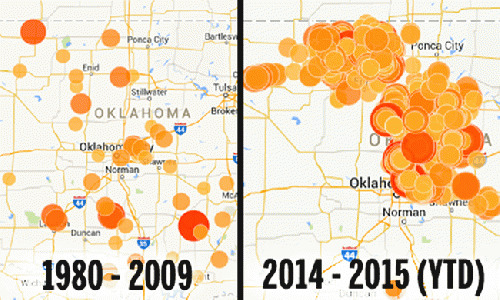 Despite the enormous increase in earthquakes in Oklahoma that started at the same time as heavy fracking began there -- with the number of earthquakes over 3.0 magnitude skyrocketing from an average of less than two a year to 585 last year -- the state has been in official denial about the cause. Now the state has not only admitted that the injection into deep underground wells of fluid byproducts from drilling operations is behind the quakes, but it put up a website titled Earthquakes in Oklahoma that is a "one-stop source for information on earthquakes in Oklahoma." The site includes an interactive map that displays the dramatic change not only in the number of earthquakes but in their distribution. Instead of a scattering around the state, they're clustered heavily in areas where drilling operations are disposing of fracking wastewater. The new website says, in a post dated April 21, "The Oklahoma Geological Survey announced today the majority of recent earthquakes in central and north-central Oklahoma are likely triggered by the injection of produced water in disposal wells." "Oklahoma experienced 585 magnitude 3+ earthquakes in 2014 compared to 109 events recorded in 2013," it says on the front page. "This rise in seismic events has the attention of scientists, citizens, policymakers, media and industry. See what information and research state officials and regulators are relying on as the situation progresses." "While we understand that Oklahoma has historically experienced some level of seismicity, we know that the recent rise in earthquakes cannot be entirely attributed to natural causes. Seismologists have documented the relationship between wastewater disposal and triggered seismic activity. The Oklahoma Geological Survey has determined that the majority of recent earthquakes in central and north-central Oklahoma are very likely triggered by the injection of produced water in disposal wells." "There is broad agreement among seismologists that the disposal of water into or in communication with basement rock presents a potential risk for triggering seismicity." That's a big turnaround from recent years in which the state has officially ignored or denied this connection under pressure from the oil and gas industry. Last month, media outlets, including Bloomberg and Energy Wire, revealed that a trove of official emails released by the Oklahoma Geological Survey in response to a public records request showed that Oklahoma City oil and gas billionaire Harold Hamm, who is known as the father of the U.S. fracking boom, became involved in conversations about what was causing the earthquakes. State seismologist Austin Holland was called to a meeting with Hamm and University of Oklahoma president David Boren, who sits on the board of Hamm's company, Continental Resources. In the article Big Oil Pressured Scientists Over Fracking Wastewater's Link to Quakes, Bloomberg reported, "Hamm requested that Holland be careful when publicly discussing the possible connection between oil and gas operations and a big jump in the number of earthquakes, which geological researchers were increasingly tying to the underground disposal of oil and gas wastewater, a byproduct of the fracking boom that Continental has helped pioneer." While the state has done an official about-face, the Oklahoma Oil and Gas Association (OKOGA) continued to deny that there was solid proof that the quakes were connected to wastewater injection. "There may be a link between earthquakes and disposal wells," said OKAGO president Chad Warmington. "But we -- industry, regulators, researchers, lawmakers or state residents -- still don't know enough about how wastewater injection impacts Oklahoma's underground faults. We don't know enough about what's really going on in the subsurface to know how to mitigate some of this risk." Luckily, the new website has diagrams explaining it. If that's not enough for him, the U.S. Geological Survey (USGS) released a report today outlining models that forecast the potential earthquake damage in areas of induced seismicity. The USGS says bluntly, "Earthquake activity has sharply increased since 2009 in the central and eastern United States. The increase has been linked to industrial operations that dispose of wastewater by injecting it into deep wells." "This new report describes for the first time how injection-induced earthquakes can be incorporated into U.S. seismic hazard maps," said Mark Petersen, chief of the USGS National Seismic Hazard Modeling Project. "These earthquakes are occurring at a higher rate than ever before and pose a much greater risk to people living nearby. The USGS is developing methods that overcome the challenges in assessing seismic hazards in these regions in order to support decisions that help keep communities safe from ground shaking." Mark Ruffalo: "Monsanto Chief is Horrible"
First Florida, Now Wisconsin, Bans the Words "Climate Change"
Bill McKibben Gets Arrested Exposing Exxon's "Unparalleled Evil"